The fantastic Pace and Kyeli Smith run an annual online writing workshop, focusing on helping students produce writing which matters. How you define “world changing” is up to you! Last year, I contributed an ebook for the (fantastic) pack of bonus material. This year, I’ve contributed an ebook again – but more importantly, I’m one of the six workshop speakers. The main sessions run in June and July. In mine, I’m going to be talking about making a living from writing – and touching on fiction-writing too. The five other fantastic speakers have an incredible amount of experience between them, and they’ll be talking about how to be inspiring, how to teach, and how to get the words out of your head and onto the page. The workshop consists of eight hour-long sessions (which are recorded and transcribed – you don’t have to call in live), a workbook with exercises from each speaker, an awesome pack of bonuses, and an exclusive forum where you can chat with other writers. You can get the first session of the workshop – which runs this Thursday, 12th May – completely free, plus the final session from last year, from this page. Maybe the World Changing Writing Workshop is a bit big for you, or it doesn’t quite suit the sort of writing that you’re doing. I’m busy working on a new ecourse, Blog On, that I’ll be opening up for registration in early June (hint, if you get the ebook, you’ll also get a discount on the course). Blog On is an extremely hands-on eight week course where I’ll take you through four major types of blog post, giving you step-by-step guidance so that by the end of the eight weeks, you’ll have four really strong, valuable posts on your blog. All the lessons will be delivered as text, and you’ll get templates to help you write each type of post. I’ll also be doing a Q&A, group critiques, and running a prize draw at the end of the course. If that sounds like fun, watch out for more details. It’s likely to be around $40-$50 for the eight weeks, with some premium options if you want them. 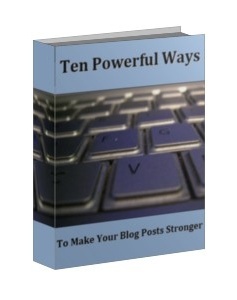 Last week, I published Ten Powerful Ways to Make Your Blog Posts Stronger – a short, action-packed ebook to help you make the most of your blog posts. You can get your copy here. I like the alliteration of a world-changing, writing workshop. If ever there was a time that the pen is mightier than the sword, now is the time. It’s an awesome name, isn’t it? It’s great to know, Ali, that you are teaming up with other, creative spirits. This team-teaching holds a lot of promise to make a positive impact on the lives of wannabe creative people. I believe they can learn a lot from your expertise and the combined experience of your associates. Down the line, the ROI will be clear and measurable, me thinks. It looks like a sound investment of time, money and energy. Please continue to offer such courses/classes directed toward personal growth and professional development. You’ve come a long way. Your literary sojourns have really led to new opportunities. Who could have imagined this years ago? Cheerio. Cheers Archan! I learn a lot from the people who I team up with, too (and of course I hope that I am indeed valuable to them). I love the freebie. Lots of useful tips. But… I do have one small ‘complaint’. The “Further Reading” links are great, but they don’t open in a new window. As a usability specialist I find this a bit frustrating. I already had to go back to my gmail a few times. But besides the ‘complaint’, great stuff! Thanks Dewi, glad you like it! Thanks so much for your second ebook. I’ve been diligently working my way through it – took me ages to work out how to put the FB like button on the bottom of each post, until I found a very simple explanation on another blog and bingo! There it is. It was a small accomplishment but I felt very proud of myself! Awesome, and well done! 🙂 I know how tough the learning curve is at times … I’ve certainly spent my share of hours trying to accomplish tiny blog-related things. It’s so satisfying when you get it right, though, isn’t it? Ok, me again. Just wanted to say that I included a plug for you in my latest blog as a way of saying thanks for sending your ideas out into the world. Hope it sends a bit of traffic your way.